What is the purpose of your life? To do something legendary? To gain followers? To be remembered for something wonderful that you did? Even the most famous person or the richest mogul will eventually be a name on a tombstone. So what are you living for? When we look to ourselves for meaning and purpose, we fall short. The amassing of riches and followers is a dead end path. The ultimate destination is self. With self-gratification as the ultimate goal, we are left with a strong sense of purposelessness. How often do you check for followers, for likes and unlikes on your social feeds? The Bible says that people who trust in themselves or their followers will perish. The pursuit of acceptance outside of Jesus is a never-ending, meaningless existence. 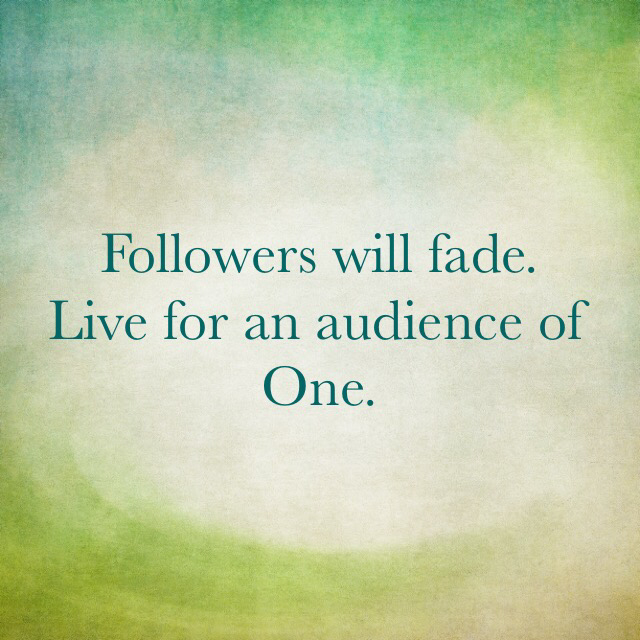 Will you live for an audience of One? Do you understand that the world’s opinion of you will rise and fall? Eventually, people will forget your name. But, the One who matters most - Jesus Christ - will never forget you. He has the ability to bring real meaning to your life. His opinion counts! Get off the dead end path of gaining worldly followers. Get on a new road of living for the opinion of One, your Lord Jesus. His path leads to everlasting life.